From left to right: Fred Blakeslee, Bob Schultz, Patricia Stout, Debi Hoskins Bauder and Alex Reed Fogle pose for a photo on the west side of Hayes High School Thursday. The group will celebrate its 50th year class reunion in August during a series of events. 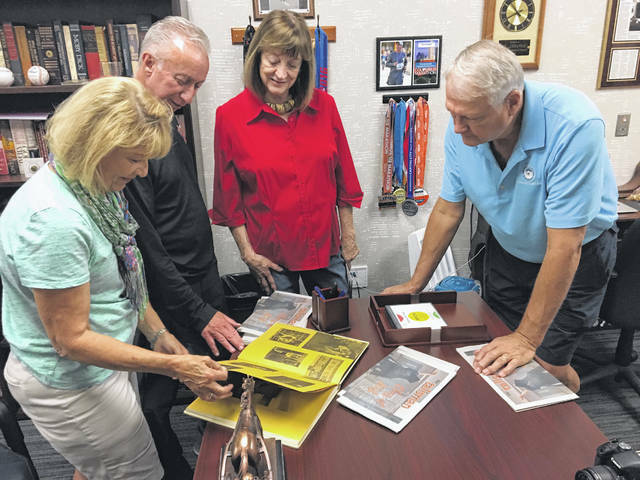 From left to right: Patricia Stout, Hayes Principal Richard Stranges, Alex Reed Fogle and Bob Schultz look at a yearbook from 1968 on Thursday after Stranges gave the group a tour. Stout organized the tour with Stranges, adding she appreciated that students are still walking the same halls that she did 50 years ago, with some improvements. 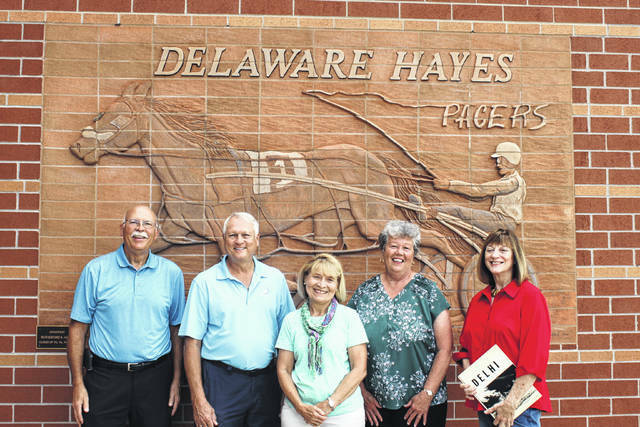 Delaware Hayes High School Principal Richard Stranges gave a special tour of the school on Thursday to a group of students from the class of 1968 who are preparing for their 50th class reunion in August. Stranges led a small group from the class on a tour through the new areas of the high school and through some of the old areas that have been renovated. Patricia Stout said the class is preparing three days of reunion events: a party at Brookshire on the evening of Aug. 23; a tour of Hayes High School at 3:30 p.m. on Aug. 24 with a dinner at Old Bag of Nails at 6 p.m. and the Hayes versus Buckeye Valley football game at 7 p.m.; and Saturday, Aug. 25, is reserved for classmates to make plans for meals and afternoon activities. The tickets for the Aug. 23 event are $55 per graduate, which includes a class photo, and $45 per guest. Tickets for the Hayes versus Buckeye Valley football game are $7. Stout brought a few of her classmates to the high school Thursday to start raising awareness for the upcoming reunion. Stranges took them to the new Rowland Science wing and through the older parts of the school. The visitors reminisced about the school and told Stranges what the school was like when they attended. “It’s shocking,” said Debi Hoskins Bauder. Bauder’s classmate, Alex Reed Fogle, said “It was nice to see progress” at the school. “It was remarkable to see how they were able to incorporate the old into the new,” said Fred Blakeslee. Stout said she “appreciated the fact that kids are walking the same hallways” they did when they were in high school. More information can be found on the class’ Facebook group: Hayes High School Class of 1968 – 50th reunion. Donations are being collected to help with the reunion costs, and checks can be sent to Brenda (Strohl) Steinbrecher at 196 Curly Smart Circle, Delaware, Ohio 43015. Checks can be made payable to Hayes High School Class of 1968. Classmate contact information can be sent to Carol (McKirgan) Birsa at carolbirsa@aol.com. Additionally, Blakeslee is collecting photographs for the reunion and has asked that classmates email him photos from their yearbooks, previous class reunions, and current photos to blakesleef@gmail.com.